On the floor of library, Leah and Chayse discuss fellow students, the hypocrisy of happiness, and the tragic thought of “what could have been” on the eve of prom. Their obvious attraction to each other overshadowed by a pending catastrophe. HELPLESS was written and produced by Evan Scott Russell, directed by Christene Hurley, with cinematography by Chris Ellison, and edited by Isaac Banks. HELPESS also features Dylan Arnold (UNCSA School of Drama) and Mary Mattison Vallery (UNCSA School of Drama), along with Evan Scott Russell in the cast. The film was created as a seven-minute, second year film. It screened at a dozen film festivals, winning best of category honors at seven festivals including Best Short Film from Women In Film & Television at the 2014 Nashville Film Festival. All of the filmmakers graduated from UNCSA in May 2015. 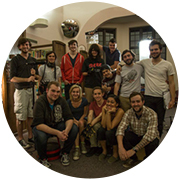 Writer/Producer Evan Scott Russell and Director Christene Hurley have both been chosen as two of “110 Students to Watch” The list will be part of the annual Variety Entertainment Education Report, which covers media programs at colleges and universities worldwide and was published on April 28, 2015. Television has the power to change lives. Public television has the responsibility to change lives for the better: a child far from urban resources is inspired to become a scientist, a high school dropout earns a GED, a homebound senior remains connected to the world of arts and culture, the family of an Alzheimer’s patient finds strength and support. UNC-TV’s unique programs and public media services provide people of all ages with enriching, life-changing television.